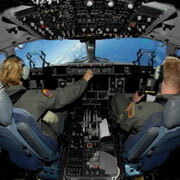 Military organizations with a global mission require a comprehensive worldwide navigation database that includes both civil military datasets for their aircraft flight management systems (FMS) cockpit GPS units. Jeppesen's NavData aeronautical database provides military aviation organizations around the world the data they need to navigate the increasingly complex global airspace system. Using only original source information from the global civil and military Aeronautical Information Publications (AIP) library, Jeppesen maintains an aviation information database that contains over one million records and carefully analyzes, validates, and verifies over 30,000 pieces of source information every month from virtually every country in the world. Jeppesen formats these civil and military records in accordance with Aeronautical Radio, Inc. (ARINC) Specification 424, the global standard for navigation system databases and creates the unique electronic format outputs required by the major FMS and GPS unit and Original Equipment Manufacturers (OEMs). Jeppesen also has the capability to process unique customer data and add it to an individual military organization's navigation data package, including custom terminal approach procedures, custom waypoints, or custom routes. Jeppesen can also tailor individual databases by geographical area, latitude/longitude boundaries, record types, runway lengths, etc. Jeppesen processes its navigation data using thorough data validation and verification procedures that are ISO certified and fully compliant with the guidance provided in the Radio Technical Commission for Aeronautics (RTCA) DO-200A and European Organisation for Civil Aviation Equipment (EUROCAE) ED-76 standards for the processing of aeronautical data.